Deck Depot - The #1 Place to buy Deck Lighting | Post Caps | Deck Balusters | So - CLEARANCE & SALE ITEMS! Home > DECK LIGHTING > CLEARANCE & SALE ITEMS! Highpoint Arapahoe Rail Light - Sale! Highpoint Golden Gate Step Light - Midnight Black - Sale! Highpoint Golden Gate Step Light - Stainless Steel - Sale! Highpoint Moab Step Light - Solid Copper - Sale! 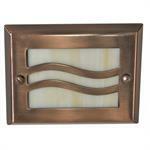 Highpoint Genesis Step Light - Antique Copper - Sale!